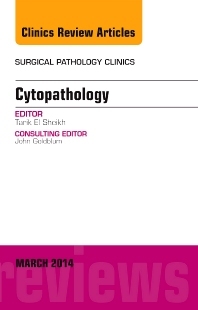 Topics that are essential to the surgical pathologist in cytopathology are included in this issue of Surgical Pathology Clinics. Topics include cytopathology of the Thyroid; Pancreas, Salivary glands; Lung; Urine; Gynecologic; Metastasis of unknown origin; and Preparation techniques and Cell transfer. Expert cytopathologist and prolific author and researcher and expert clinician Tarik Elsheikh leads this issue as Guest Editor. "The latest edition of this book is always in use by our trainees and cytology staff. A most helpful up to date reference book"